The Matrix started out as something almost revolutionary in Western cinema. The Matrix Reloaded tried to take us further down the rabbit hole but left us a little lost and confused instead. And so I'm sure a lot of us weren't quite sure what to hope for when The Matrix Revolutions, the final movie in this trilogy, finally hit theaters. Sure, we wanted to see this little adventure to the end, but it had become a bit of a question whether or not things were going to get better after we barely survived the droning explanation of the Human-Machine world order as explained by The Architect in the second movie. This third movie really wanted make things bigger than ever. After all, they had a lot of things to resolve in order to prevent outright rioting in the streets by movie-goers who just want to see the end of this story. But there were quite a number of questions including things like figuring out what the heck Agent Smith had become and whether or not the last human city of Zion would still stand. And to be fair, the movie did manage to address most of those plot points. But in true Matrix fashion, they also left us with quite a few questions as well. Synopsis: The Matrix Revolutions is the third and final movie in the Matrix trilogy as written and directed by the Wachowskis. And while it had a decent showing at the box office, it still didn't do as well as the prior movie - which is a disappointing statement in itself. Leaving off from the last movie, Neo (Keanu Reeves) and Bane (Ian Bliss) are still unconscious in the medical bay of the hovercraft Hammer. But Bane isn't himself anymore - his consciousness was overwritten by an Agent Smith (Hugo Weaving) program who managed to cross into the real world. As for Neo, his consciousness is trapped in some purgatory-like train station that is a crossing point between the Matrix and the Machine City. There he meets a family of programs who explain that the station is controlled by another program called the Trainman (Bruce Spence), who unfortunately is an agent of the Merovingian (Lambert Wilson). While Neo tries to figure out how to escape the virtual subway station, Morpheus (Laurence Fisburne) and Trinity (Carrie-Anne Moss) are approached by Seraph (Collin Chou), who has come on behalf of the Oracle (now Mary Alice) to inform them of what had befallen Neo. Thus they venture off to bargain with the Merovingian for his release. Meanwhile the humans are under attack on all fronts. 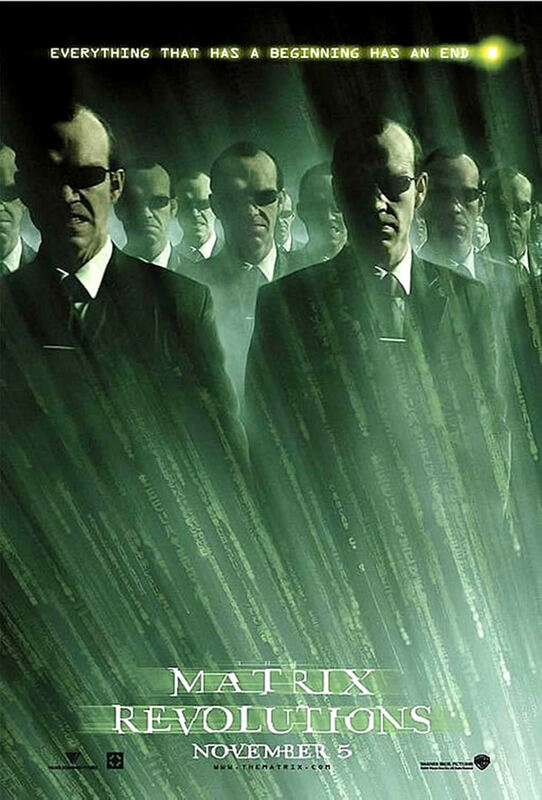 Within the Matrix they face a growing number of Smiths that are able to take over other personalities in order to create additional copies of himself. Back in Zion, a massive fleet of Sentinels is just about to breach the walls of the city, as mentioned at the end of the last movie. As I go over that quite summary of how the movie starts off, it's a mix of the good and the bad. The last stand of humanity against the machines? That sounds pretty cool! Neo stuck in a subway station? Okay, this is literally the movie not moving at all. Agent Smiths taking over the Matrix? Interesting, but not exactly riveting. At the end of the day, it felt like a silly excuse to see how far they could push computer graphics in terms of all those duplicate Hugo Weavings. Sometimes it was creepy. A lot of times it just looked silly. At least the movie tried to step away from the pseudo philosophical mess that the Architect dumped on audiences at the end of the last movie. Instead we had some pretty clear objectives that resulted in the team splitting up to achieve those different goals. Eventually Neo decides the best thing to do is to go directly to the Machine City to plead humanity's case. Meanwhile the rest of the Nebuchadnezzar venture back to Zion to somehow help with the defenses of the city, even though a single ship may prove a little useless against all those robots. But then things once again took a turn for the worse when Neo does get to the Machine City and makes the most ridiculous of deals possible. I guess it sort of made relative sense from a narrative perspective, but it just didn't feel like quite a satisfying an ending as before. But I suppose it was better than getting another grungy rave party in that underground cave like before. Thankfully, a single movie does not define an entire trilogy. Sure, the Matrix movies just got worse and worse with each passing sequel, but as a whole the impact on our shared pop culture consciousness was rather phenomenal and soon so many movies would be taking from what the Matrix franchise taught movie makers in terms of what was possible and shaped the next wave of big budget summer blockbusters for years to come. But in terms of this last movie, The Matrix Revolutions, I can't say that we all got the ending that we wanted. It was still a confusing mess of a film with some really bad plot twists that they hoped to hide behind some fun fight sequences. In the end, I can only rate the movie as 2 could-have-been-kickass armored power suits out of a possible 5.